dates unknown but in the period early 1950s to mid-1960's. By courtesy of Nigel Paterson. 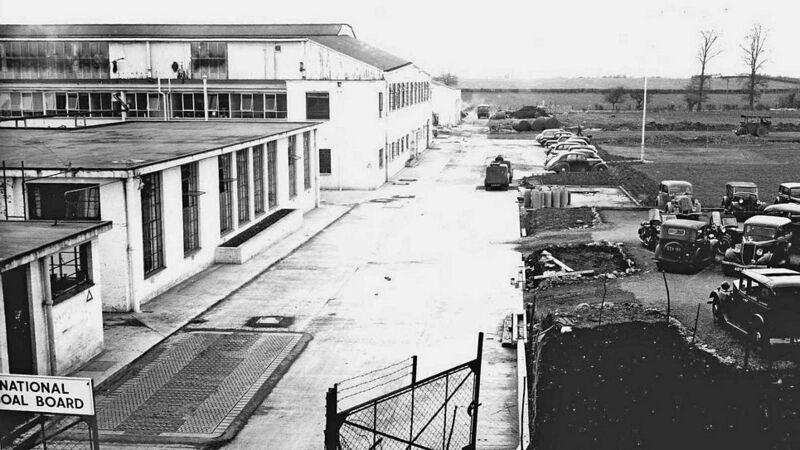 View along the entrance roadway, with the gate house and canteen building to the left, followed by the Main Hanger Building. 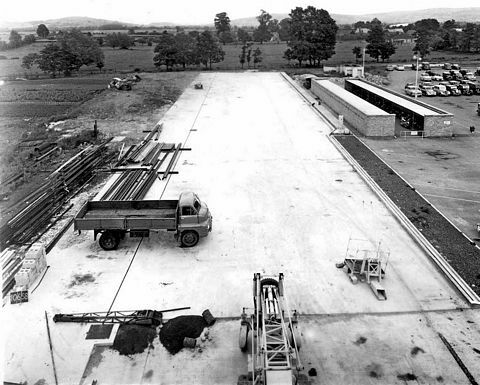 Notice that the Hanger Building has been widened along its length with new office accomodation and the garage building has been completed (furthest building on the left). This view is believed to have been taken in early 1954. View to the RHS of the entrance gate, across the field that will eventually be the site of the new office block. 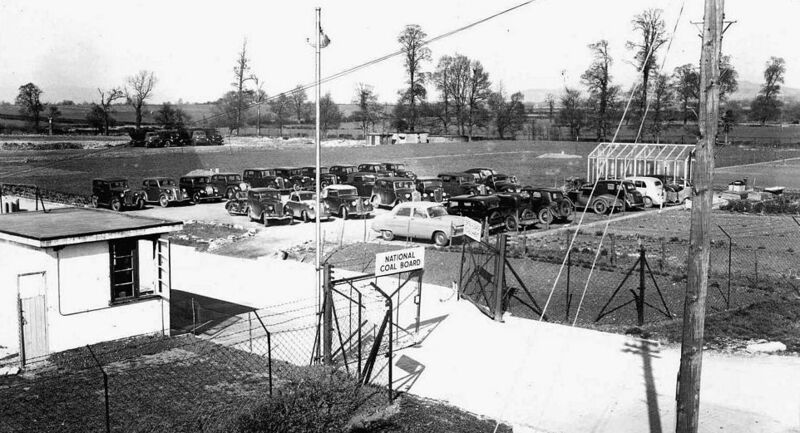 View looking back towards the gate and across the original site carpark to the Stoke Road. 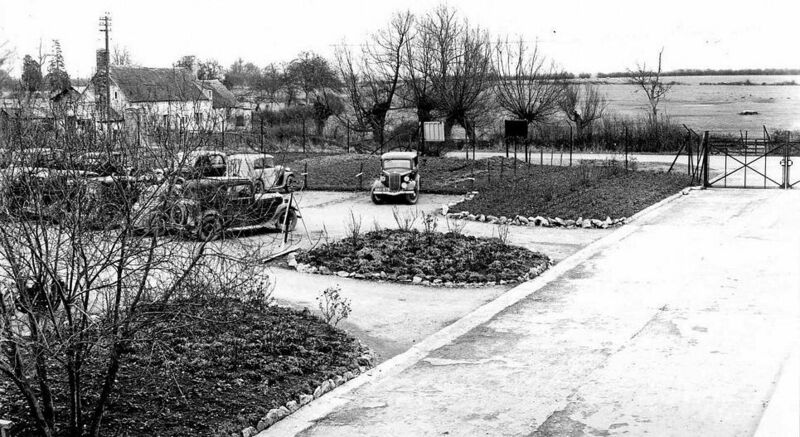 Notice the smart cottage on the far side of the road, where Stoke Orchard Garage was eventually located. 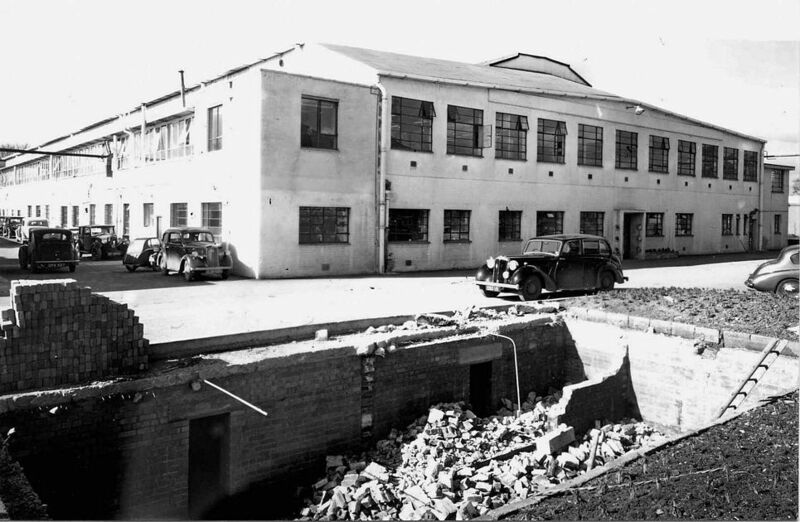 The garage block and PB16 under construction. 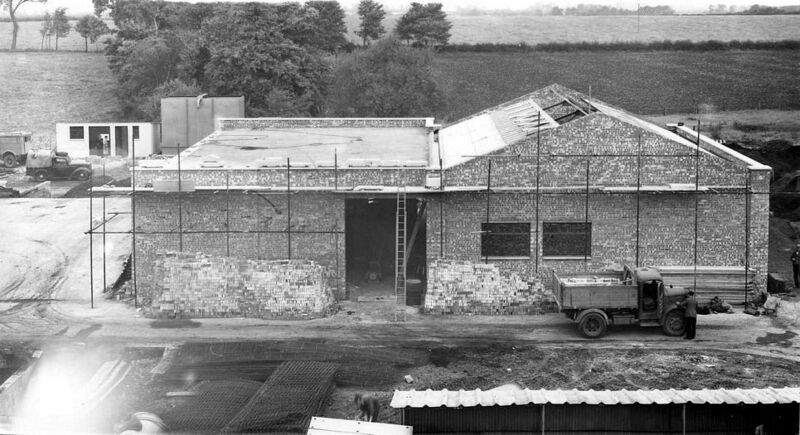 PB16, the flat roofed extension behind the garage block, is where the first gasifiers were housed. 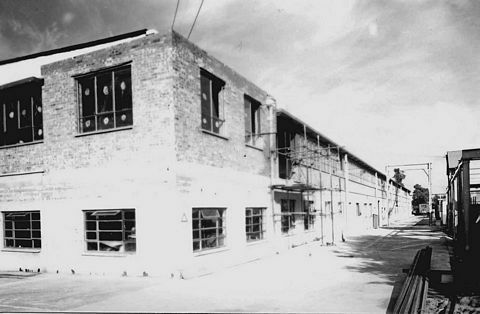 This building was already part completed when the site was purchased, in 1948. Garage and PB16 completed. Possibly work has started on constructing the Boiler House and Shower Block (foreground). 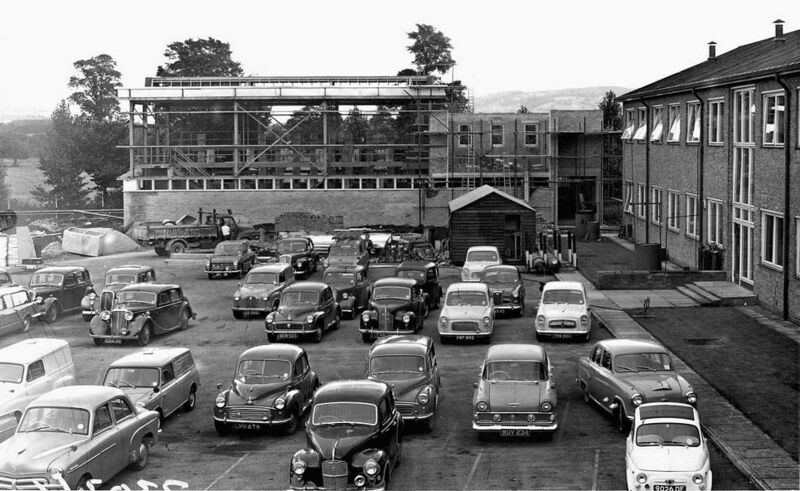 What seems to be an Austin A30 outside PB16 shows this photograph must date post-1951 and more likely sometime in 1953. This building was extended twice. 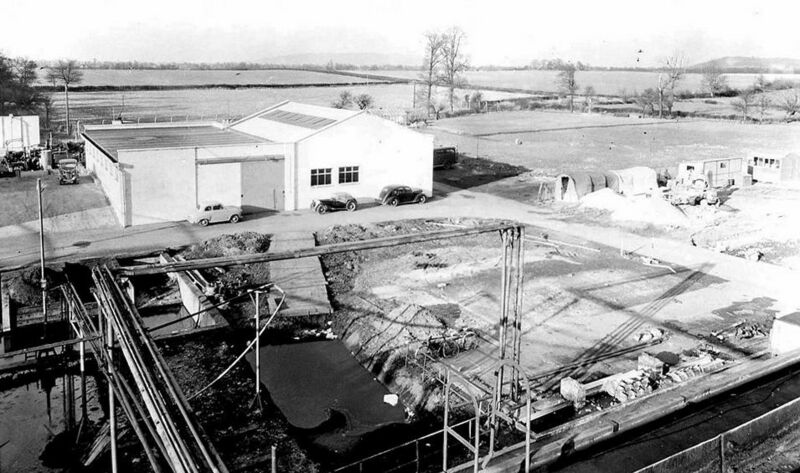 The Domestic Heating Laboratory was added in the early 1960's, see lower down this page. 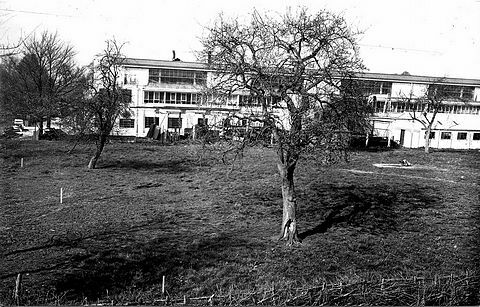 Further offices and laboratories were added in the mid-1970s to turn the original 'L' shape (as can be seen immediately below) into a square, with a central open grassed croquet lawn. 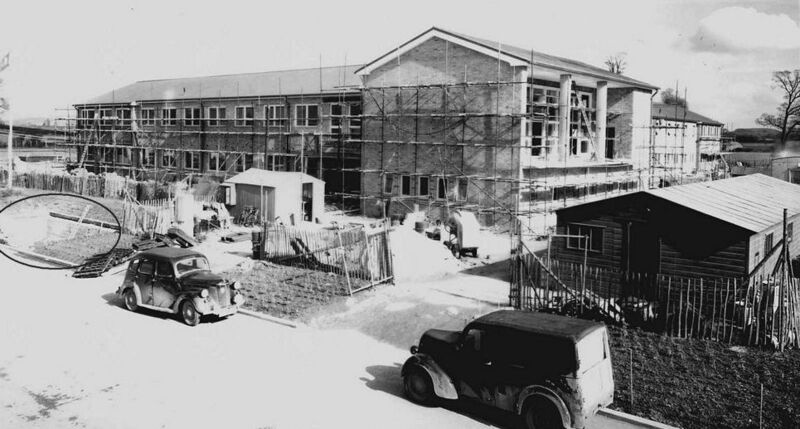 The new office building construction has progressed, maybe summer 1955. But notice the hole, mid-centre left (circled) with a ladder protruding. And now see below ! This is believed to be the same hole as I've circled in the picture above. Martyn Davis tells me this 'pit' housed a water tank to be used for firefighting and was retained for the purpose until site closure. one under the Shower Block and the other further towards the far end. The one shown here would subsequently have been under the roadway entrance to the new office building's parking area, leading to the main foyer doors. The section of the new office building facing the Stoke Road (on its far side), is on the RHS of this picture and seems complete and in use (see some open windows). 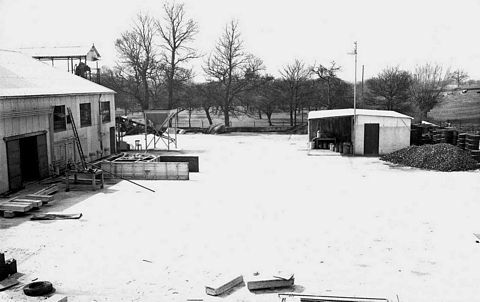 In the background can be seen construction of the Domestic Heating Laboratory. 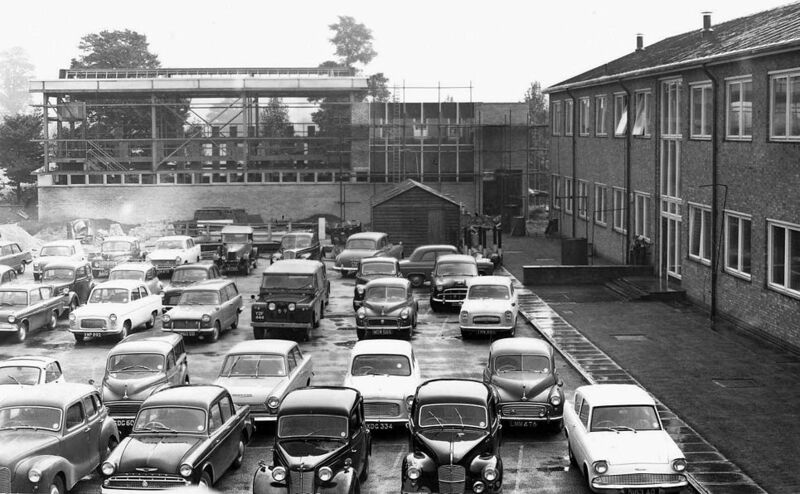 The cars (Ford Anglia, Mk1 Cortina etc) show this to date into the early 1960s, maybe 1962. Similar to the above view but with apparent progress in the centre background. Maybe some scaffolding has been removed. Below are a few more pictures from Nigel Paterson, but perhaps not adding much to those above. Nonetheless, if anyone spots anything significant, and wants to name what / where it shows, then do let me know. RHS of the main entrance roadway before the new office building. 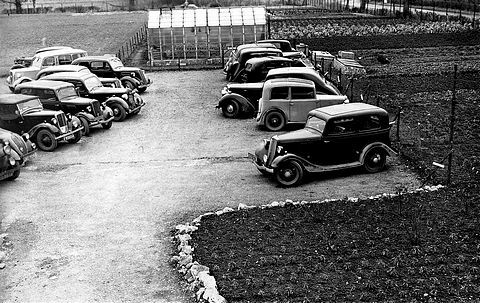 Original carpark, RHS of main entrance roadway, just inside the gate. this roadway would have been leading away from the new boiler house. 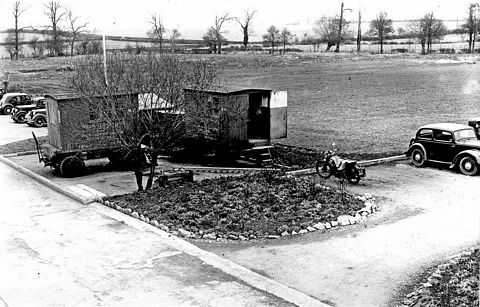 View along the Stoke Road, with gate house, Enginering Branch building and Main Hanger building. 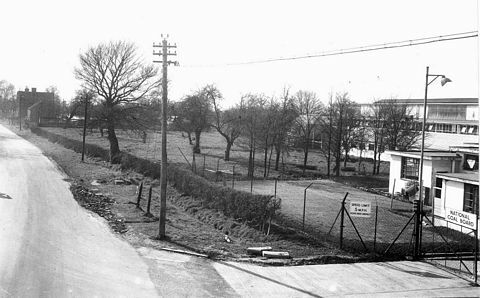 Note the lack of houses facing onto the Stoke Road at this time. Not sure which PB this is. 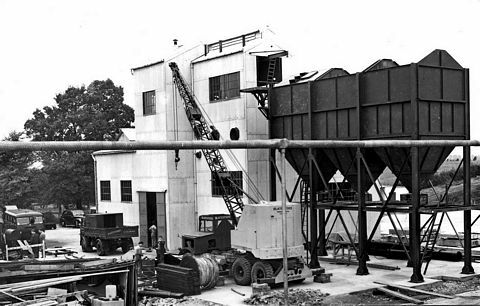 It may have been built to accomodate the 1tph fluidised bed coal carboniser. The far end corner of the Main Hanger building under modification. 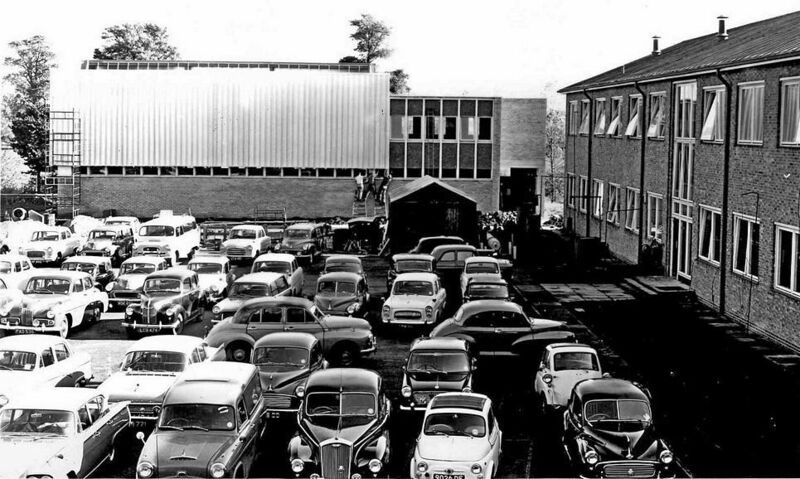 View from the Stoke Road, LHS of the main entrance. 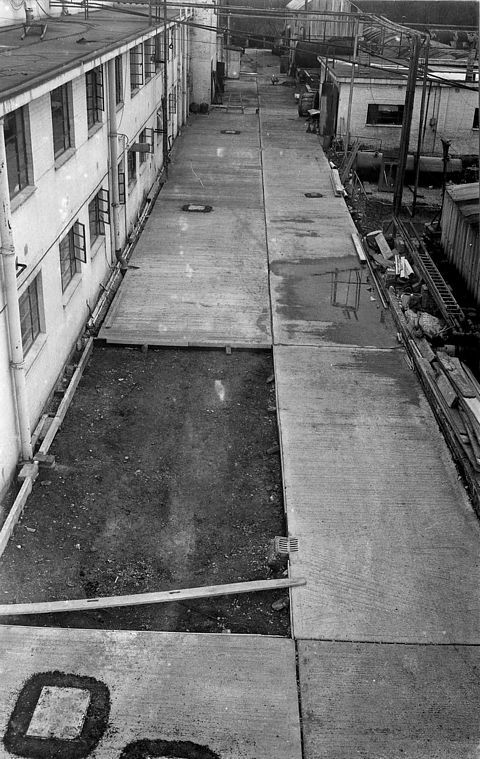 The roadway under construction or repair, RHS of the Main Hanger building (looking from the direction of the main entrance roadway).